How Robotic Pool Cleaners Work? Why a Robotic Pool Cleaner? How quickly can you clean the pool? Throwing out late night parties, gatherings with loved ones, toning your muscles and many more to do with your infinity swimming pool. It sounds like quite amazing to be an owner of a swimming pool sitting on your back or front yard. But, do you feel the same when coming to cleaning your luxurious swimming pool? I guess not. Most of the pool owners end up being frustrated after cleaning the swimming pool. Well, it won’t be that bad if you have got the right pool cleaner in your hands. How about a robotic pool cleaner? Here is your savior from hard work and frustration. A best robotic pool cleaner is an automated pool cleaner which will do all the hard stuff for you. I say that because all you need to do is to plug the robotic pool cleaner into an electrical outlet and it would do the cleaning. Unlike the other pool cleaners, you need not attach the robotic pool cleaner to the filtration system of the pool. It goes down to the bottom of the pool and cleans all the calcium deposits and suction dirt. It will help you to keep your pool cleaner than before. The robotic pool cleaner has two motors namely; the pump motor and the drive motor. There are two different motors inside of any robotic pool cleaner, each with its job. The job of the pump motor is to pump water through the filter of the pool cleaner and send it back to the swimming pool. The role of the drive motor is to turn the brushes and tracks of the pool cleaner. There are robotic pool cleaners which come with a motherboard and sensors too. These cleaners are quite impressive since they can detect walls and move along by avoiding them and even climbing them. This type of filters can have multiple walking patterns too. Robotic pool cleaners are the best pool cleaners that you will find in the market. Maintaining a pool is never that easy when it comes to cleaning since it consumes both your time and effort if you use the wrong equipment. On the other hand, using a robotic pool cleaner will save both your time and effort since they do not require any help from a human. Another advantage of using a robotic pool cleaner is that using it daily will keep your swimming pool at the required pH levels. You can clean your pool all by yourself with a robotic pool cleaner. Buying a robotic pool cleaner is cheaper than hiring a professional pool cleaning team. A robotic pool cleaner is an economical choice with fruitful results. We can’t name an exact time since the time taken to clean the swimming pool depending on the quality of your pool cleaner and the size of your swimming pool. But we can expect the regular cleaning of a robotic cleaner to last for at least 3 hours. 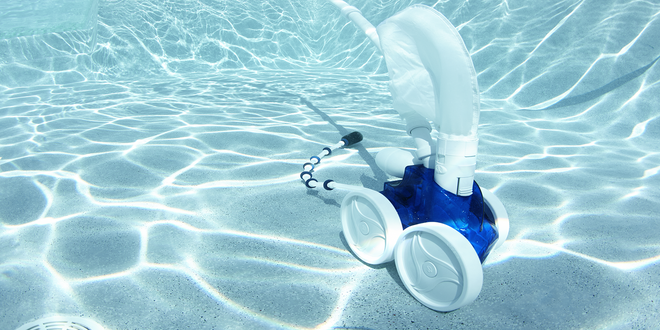 Using a robotic pool cleaner once a week will help to keep your swimming pool cleaner than before.